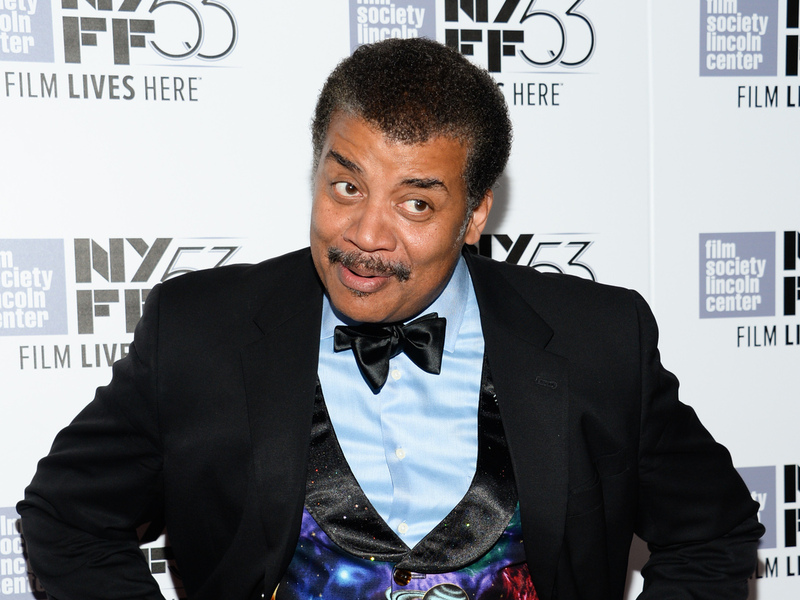 Neil DeGrasse Tyson Gets Into A Rap Battle With B.o.B Over Flat Earth Theory : The Two-Way The famed astrophysicist got into a Twitter spat with the rapper, which then turned into a bona fide rap battle. Astrophysicist Neil deGrasse Tyson released a track in response to rapper B.o.B's song promoting the flat Earth theory. So, a Twitter spat between astrophysicist Neil deGrasse Tyson and rapper B.o.B over the flat Earth theory has turned into a full-blown rap battle (and it's way better than Drake vs. Meek Mill). B.o.B, whom you might know from his hits "Airplanes," "Nothin' On You" and "Strange Clouds," kicked things off Monday when he started tweeting about how he believes the Earth is flat. He also tweeted about why he believes NASA is hiding the truth about the edge of the world. And he shared several meaningless diagrams about the planet including one about flight routes. The rapper fired off more than 50 tweets, saying things like "I'm going up against the greatest liars in history ... you've been tremendously deceived," before Tyson took to Twitter to respond. Tyson's last tweet to B.o.B was, "Duude — to be clear: Being five centuries regressed in your reasoning doesn't mean we all can't still like your music." So, naturally, B.o.B whipped up a song about the why the Earth is flat, called "Flatline," that expanded on the theory, called out Tyson by name and also name-dropped David Irving, a renowned Holocaust denier. Here's one line: "Aye, Neil Tyson need to loosen up his vest / They'll probably write that man one hell of a check." Here's another: "I see only good things on the horizon / That's probably why the horizon is always rising / Indoctrinated in a cult called science / And graduated to a club full of liars." You can read the full lyrics on Gawker. "Very important that I clear this up / You say that Neil's vest is what he needs to loosen up? / The ignorance you're spinning helps to keep people enslaved, I mean mentally." "All those strange clouds must be messing with your brain." "I think it's very clear that Bobby didn't read enough / And he's believing all this conspiracy theory stuff." Alarmingly, B.O.B isn't the first celebrity flat Earth truther. Earlier this month, Tila Tequila, of MTV fame, fired off a series of tweets demanding proof the Earth was round. Hopefully, Tyson's track is the last word, or rap, on the matter.